Martin Grant unveiled his new collection for Autumn Winter 2015/16 with an intimate show in his newly expanded showroom in rue Charlot, Paris. Grant once more showed his seamless ability to combine classic elegance with a modern attitude – combining refined fabrics, textures, precise tailoring and exquisite detailing. Quilted and brocade fabrics gave structure to oversized coats, the glazed leather brought a lightness of touch to an A-line skirt, Mongolian wool was paired with fine suede in a cocktail dress or mixed with leather in a tightly waisted coat. Exaggerated volumes had a hidden restraint to create sharp silhouettes – waists emphasized by knotted belts, trapeze coats, wide-legged trousers and skirts extended to the ankle. 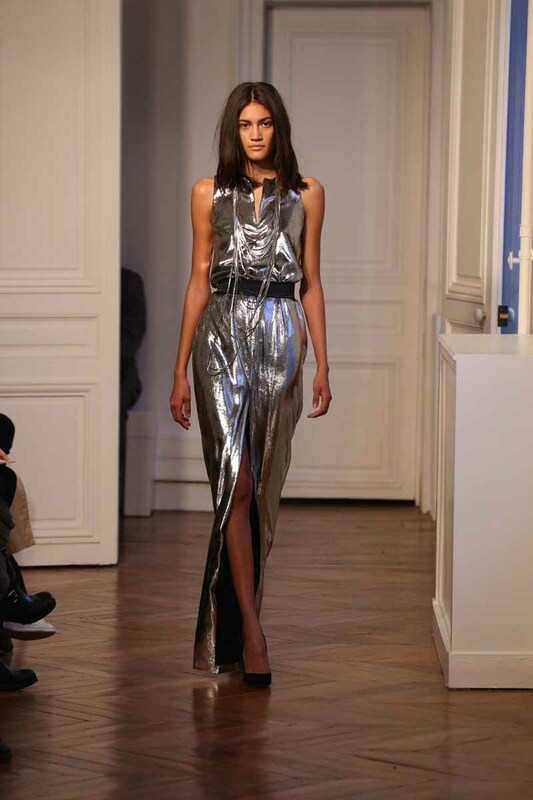 Dazzles of shine heightened evening outfits, in prints or in fluid silvered lame dresses. Once again, Martin proves that classics are always up for re-invention and that style is significantly more than trends.